The intelliPLUG’s claim to fame is being the smallest and most affordable smart plug in the world. Yes, you read that right. It looks like the whole world is moving towards having a smart home and a smart office, so it would also make perfect sense if a smart plug is part of the corresponding setup as well. 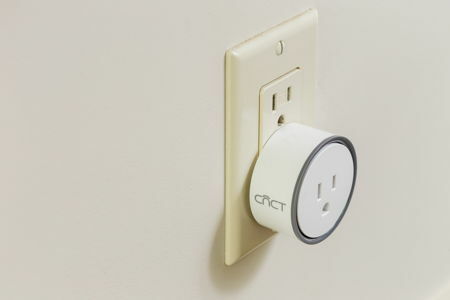 Enter the intelliPLUG from cnct — where it will help your house become a smart home for the fraction of the cost, all the while offering one the ability to enjoy control of any plugged-in device directly from a phone or tablet. Being part of an Indiegogo campaign at the moment in order to fund the product’s final development phase, we do hope to see the intelliPLUG end up as reality. It will be Wi-Fi-enabled so that this smart plug will allow users to control their lights, appliances and any “plugged-in” device directly from their phone or tablet, regardless of where they are as long as there is a decent Internet connection in the vicinity. intelliPLUG will boast of full iOS, Android and Amazon Alexa functionality, enabling users to turn on/off plugs, set timers for devices as well as schedule plugs to turn on/off automatically. Those who manage to be an early bird for the intelliPLUG will have to fork out a mere $19.99 for a 2-pack purchase, which is half the price off the recommended retail price. Even at the full retail price, it will cost less than half of what the other more established brands are selling for. Not only that, it comes with a quick three-step setup process, where all users need to do is to simply plug the intelliPLUG into any electrical outlet, download the cnct app, pair the plug with the app, and you’re good to go. It takes less than a minute, and the user can then virtually gain control of any “non-smart” appliance without missing a beat. Not only that, the intelliPLUG is small, attractive and will be able to blend in with any home environment.